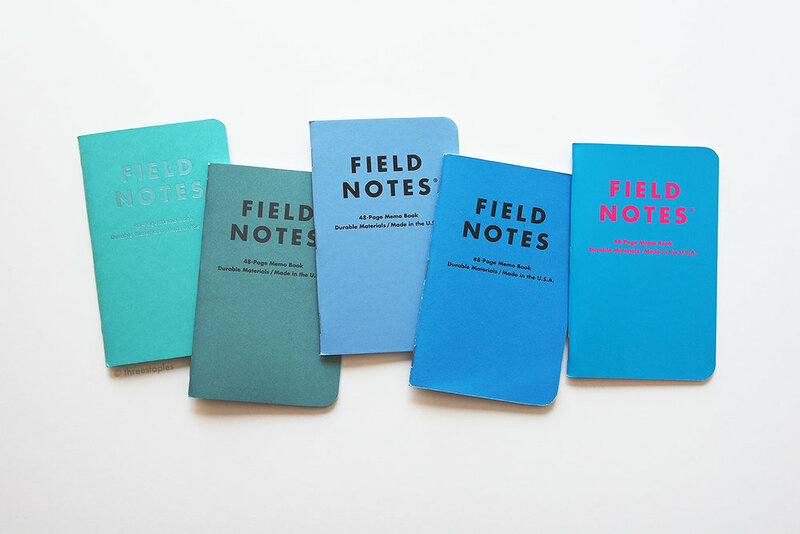 “Blue Wednesday” edition (pictured center above) is a special 2-pack of regular-sized Field Notes memo books that was offered as a free gift with any purchase at the Field Notes website, on Wednesday July 26, 2017. 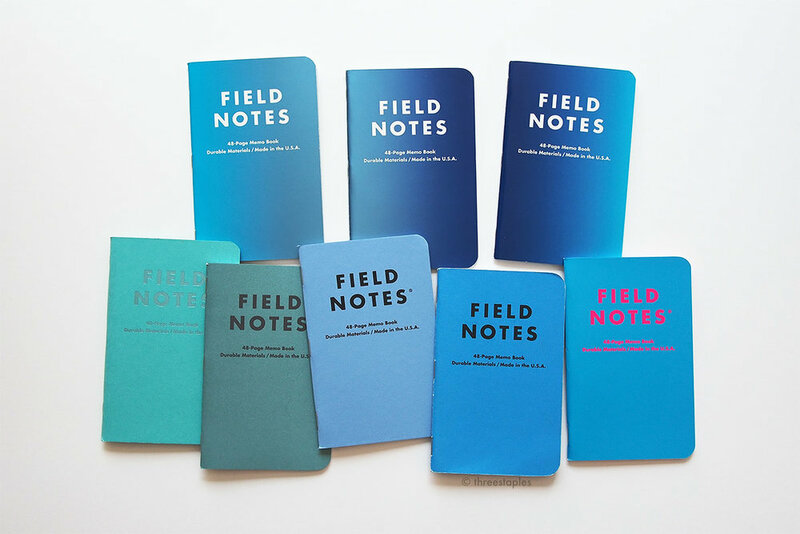 It was not the first time Field Notes offered a “Wednesday” deal (they’ve given away Pitch Black in the past), but it is the first time they created a brand new edition specifically for this kind of deal. Ah, Field Notes. Always keeping us on our toes. Were you surprised? I certainly was. Makes me wonder if they’ll offer this exact same blue edition the next time they do a Wednesday promotion, or if they’ll create a different “Wednesday” edition just for it. Anyway, I quite like this “Blue Wednesday”! Its cover is Mohawk Carnival Vellum 80#C in “Blue” with black ink, and the innards are the usual Finch Paper Opaque Smooth 60#T in “Bright White” with graph grid in the same light brown color as you’d find in the Original kraft versions. I won’t dive deep into the specs in this post though; it’s all about color for now, so here are some more pics to see how this blue compares to other blue Field Notes. Top row (from left): Starbucks “Coffee Origins” (Asia/Pacific), DDC “Sorta Jade”, Just Below Zero. Bottom Row: Just Below Zero, Butcher Blue (Commemorative Reprints), Flagged by Ellen, Sweet Tooth, Nixon (2015), Blue Wednesday, Unexposed, Summer Camp, Starbucks “Coffee Origins” (Latin America), County Fair. I don’t know about you, but I’d describe it as a medium blue. Darker than, say, Butcher Blue, but lighter than the blue from County Fair or Unexposed, even. I like it. Top row: Cold Horizon. Bottom row (from left): Sweet Tooth, Nixon (2015), Blue Wednesday, Summer Camp, Unexposed. I’m glad they were able to pull off a unique blue edition. Did you take advantage of this Wednesday offer? Do you like it? I’m continuing on my journey to write about every quarterly edition of Field Notes that I have, with a few exceptions. Last time I wrote about Drink Local, and I’m choosing Cold Horizon next, which happens to be the edition that came right after Drink Local back in 2013. As usual, I’ll talk about major “first” features with my own opinions mixed in, followed by the the summary of specifications at the end. Cold Horizon is the winter release of Field Notes from 2013, 21st in their quarterly edition series (they don’t call this “COLORS” anymore but I will here and there). It’s a simple yet striking edition with a blue gradient that spans across three UV-coated covers. It’s not one of my top favorites (see my Field Notes ranking here), but I think it was a solid release with the winter theme achieved through frosty blue colors, cool-colored innards, and the ultra-glossy covers. The glossy finish didn’t come as a surprise, considering it was a winter edition, but the gradient did. Honestly, I didn’t think I would like it, until I saw it in person. I still prefer solid covers but I think Field Notes pulled the gradient off quite nicely, and they succeeded in making the edition unique while still keeping it simple. I started using Cold Horizon as soon as it arrived as part of my subscription. Cold Horizon is not the first COLORS edition to feature non-solid covers; that would be America the Beautiful from earlier in the same year. But it is the first with covers printed in a gradient of colors. It’s actually one big, blue gradient that spans across three covers, and it wraps around, so when you put one book next to another, or back to back, the colors blend nicely from one to the other. Very neat. The inside covers are the “reverse” of the outside, with white background and blue text. The text is actually printed in the same gradient as the outer gradient (another mini “first”). It amuses me to no end that in the 2013 Field Notes recap video, Jim Coudal points this out as “totally nerdy.” Oh, but I love nerdy details like this. Text printed in different gradients inside. The belly band seems to be made of the same paper as the covers. Inside cover is not as glossy as the exterior. According to the same video, gradient is something Field Notes always wanted to do, and kudos to them for trying it. The three different covers are supposed to evoke “the deeply saturated winter twilight sky, fluorescent glacial water, and the shiny metallic glimmer of the Aurora Borealis” (respectively deep blue, fluorescent blue, and metallic blue-green). I haven’t experienced all three to know for sure but I think Field Notes captured the mood of the season quite well, especially with such a nuanced finish and an exciting blend of rich colors. Glossy, winter editions: Northerly (left) vs. Cold Horizon (this particular cover looks slightly metallic, too). By the way, Northerly, another winter edition from 2 years prior, was the first to get glossy covers, but Cold Horizon is the first to achieve the effect with UV coating (Northerly’s cover is cast-coated). When I first read this, I immediately thought of the UV coating found in picture frame glass, used for preservation purposes. But I learned that in the printing industry, UV coating means that the coating on the paper is cured by UV light and that it produces a very clear, glossy finish that resists smudging and abrasion (apparently matte finish is also possible). I must say, after using 3 of these memo books, I’m impressed at the way the covers have aged. The white of the base paper is showing through worn edges (more noticeable than in other editions probably because of the look of the gradient), and it’s not completely resistant to finger prints, but overall they’re still quite shiny. The colors are still vibrant and don’t look much different from the brand new ones, and scratches seem minimal. I should also mention that contrary to how sleek they look, the covers have a slightly grainy texture. I believe there are Field Notes fans who don’t like this texture but it doesn’t bother me. Used set (left) vs. brand new set. Innards (from top): cool gray, light green, light blue. Moving on to the interior paper. 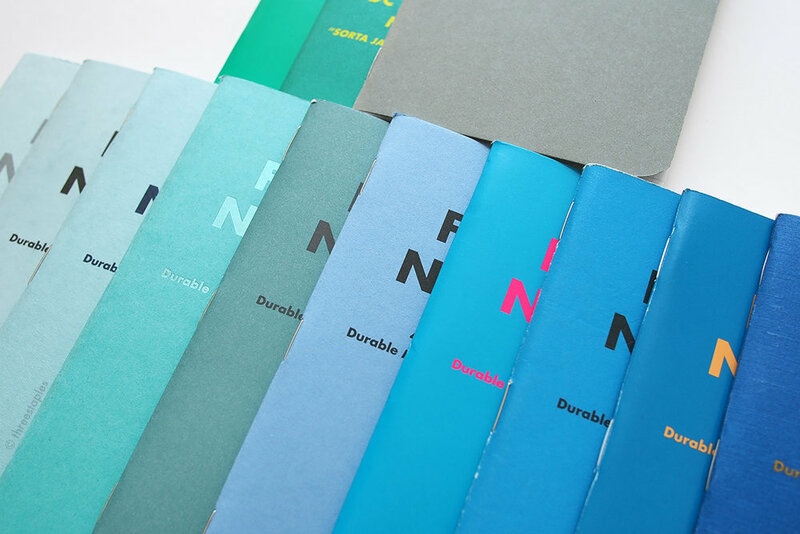 It’s not the first time in COLORS that the innards are colored (Northerly beats Cold Horizon again in that department, so does Traveling Salesman from Fall 2012) but it is the first time each book in an edition is tinted with a different color inside. The three colors are light green, light blue, and cool gray, and they’re supposed to correspond to their covers. Honestly, they’re really subtle and hard to identify, unless you view them side by side. I’m a fan of non-white innards, so I loved that I got three different colors, even though the gray color of the graph grid felt a bit distracting to my eyes. Colored innards comparison (clockwise from top right): Cold Horizon, Lunacy, Original kraft, Cold Horizon, Cold Horizon, Northerly, and Traveling Salesman. As for the body paper quality, it’s the usual Finch Paper Opaque Smooth 50#T but since it’s tinted with color, the texture feels slightly different. The difference felt subtle with my usual gel pens but a quick test with my fountain pens revealed that the extra layer of color rendered the surface more resistant to the ink. Slicker but not necessarily smooth or pleasant; the ink eventually does get absorbed though. I heard that it bleeds through more on the reverse side than in the non-colored version (listen to The Pen Addict episode 87, about 32 minutes in) but I haven’t tested enough with a variety of fountain pens or inks to corroborate that. All in all, it gets a pass from me because I use gel pens vast majority of the time with Field Notes. A couple small “firsts” before I close. It’s the first time we see Burke Printing working on a quarterly edition of Field Notes, which means different printing machines, equipment, etc. The same company also printed the next edition, Shelterwood from Spring 2014. And it’s the first time, and the only time so far, we see Appleton Utopia One as the cover stock in the COLORS series. Cold Horizon is the 2013 winter edition of COLORS, the 21st in the series. Edition size: 20,000 3-packs, or 60,000 books, November 2013. 750 new COLORS subscriptions were available starting with Cold Horizon. Printed by: Burke Printing in Lake Forest, Il. Non-solid covers (from left): Workshop Companion, Two Rivers, Cold Horizon, Shelterwood, and America the Beautiful. Only one has a gradient cover. From left: County Fair, Cold Horizon, Unexposed, Starbucks “Coffee Origins”. A quick color comparison (from left): Starbucks “Capitol Hill”, American Tradesman, Cold Horizon, Unexposed, Cold Horizon, Cold Horizon, County Fair, Starbucks “Coffee Origins”. I think almost half of all the winter Field Notes so far have featured glossy covers. What are your thoughts on that? Would you want next year’s winter edition to have another glossy cover? I don’t think I would mind too much.